Danielle Cittadino, 44, of Baldwin, said she thought she was financing her golden retriever, but she unknowingly leased the dog in 2016. How much is that doggie in the window? If you opt into a pet leasing agreement, that pup could cost nearly twice as much as what you’d pay upfront, animal rights advocates say. Activists call the practice predatory lending. In many cases, customers aren’t even aware they’re leasing the animal, thinking instead they’re entering a loan agreement. A bill, which is headed to the governor’s desk, would ban pet lending in New York State. Pet leasing was banned in Suffolk County in 2016. Danielle Cittadino, 44, of Baldwin, said she unknowingly leased a golden retriever from Shake A Paw in Lynbrook in 2016. Cittadino thought she had agreed to finance the dog and for the past 23 months has made payments of about $145, she said. But on July 30, she received an email from Monterey Financial Services, which processes payments for Wags Lending, informing her that she could either purchase the dog or return it. A customer service representative for Wags declined to comment. 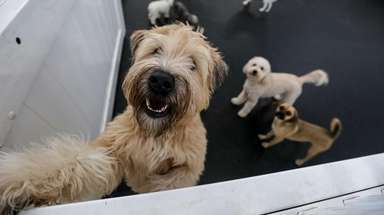 On its website, Wags describes its pet leasing plan as an “alternative financing tool” for customers who otherwise couldn’t afford to take home a pet. To buy her dog, Cittadino said her family would have to make a balloon payment of about $340 or the pooch, which the family named Max, could be repossessed. In Cittadino’s case, the Lynbrook pet store said in a statement it would cover the cost of Cittadino’s last payment “as an act of good will,” and that the store no longer partners with Wags. Cittadino’s experience is not unique, said Bill Ketzer, the ASPCA’s senior director of state legislation for the Northeast region. Pet lending services cropped up a few years ago and are similar to car leasing agreements, Ketzer said. Customers are charged monthly payments, and if they don’t pay up, the animal can be repossessed and are sometimes sent to a local animal shelter. At the end of the lease, consumers are typically offered a purchase option. Many customers, like Cittadino, don’t even realize they’re leasing the animal, Ketzer said. Suffolk Legis. Monica Martinez (D-Brentwood) said she pushed to end the practice after animal advocates brought it to her attention. The rest of the state seems poised to follow Suffolk’s lead. A new bill, sponsored by Assemb. Matthew Titone (D-Staten Island) and State Sen. Carl Marcellino (R-Syosset), aims to eliminate pet leasing in New York State. The legislation passed unanimously in both houses in June, and a spokeswoman for Marcellino said she hopes the bill will land on Gov. Andrew M. Cuomo’s desk for approval in the coming weeks. Last year California and Nevada passed bans on pet leasing. A similar bill was introduced in Rhode Island, and lawmakers in New Jersey are also considering one.